With New Years Eve falling on a Friday night this year I have no plans to venture out as it will be crazy busy in Las Vegas but I might change my mind. I’m not really interested in battling the crowds to see Diddy at Luxor’s LAX Nightclub or Ludacris at the Hard Rock’s Vanity Nightclub especially since those parties are for the young, rich, beautiful and non-local but I might be swayed into going to one of these off-the-grid events. I might start the party early with the British New Years Eve celebration at the Queen Victoria’s British Pub inside the Riviera Hotel/Casino. They will be starting the festivities at 2pm with a traditional sing-a-long and then celebrate the British New Year by watching Big Ben strike midnight (at 4pm Vegas time), including bagpipers and a complimentary champagne toast and best of all…no cover charge. I haven’t made it to the pub yet but I have met the owners and I hear from my friends that they really know how to throw a party so I just might be found there and the best part is that I can get home before the Strip gets too crazy. Or perhaps I might stop to see Bobby Kingston and his band at the Saddle ‘N’ Spurs Saloon at 2333 North Jones Blvd (SE corner of Smoke Ranch & Jones). 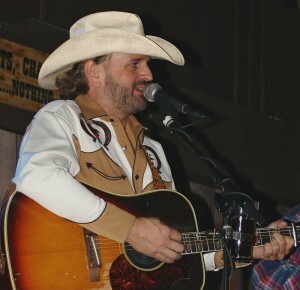 Bobby and his band goes on stage at 9pm will play great country music worthy of a two-step and the saloon also has billiards, drink specials and…get this…no cover. I reviewed Bobby Kingston in the past and you can read it here. playing Club Madrid at Sunset Station. 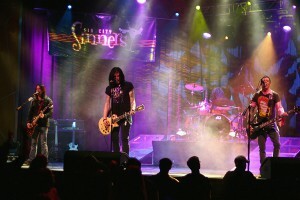 If I find myself on the east side of town, I may go see local rockers Sin City Sinners who will be playing at Sunset Station’s Club Madrid starting at 10pm. Guess what? No cover. These guys are awesome but you better get there early if you want a seat because these guys are uber popular and dare I say quite hot. I reviewed them in the past and you can read that here. If you are just not into live music or haven’t had enough of Christmas there’s a couple of things still going on that you might enjoy. On the east side of town the Ethel M Cactus Garden has been decorated for the holidays with tens of thousands of lights wrapped around the cacti and other plants. A new thing this year are the LED lights that simulate falling snow as you approach the garden’s entrance. It’s pretty cool and guess what? It’s free! Last, but certainly not least, there’s Opportunity Village’s Magical Forest. In its 19th year you can walk through the forest of hundreds of decorated trees and ride the Forest Express train and the carousel for only $7.75 to $16.25 with proceeds benefiting people with disabilities at Opportunity Village. The forest is open from 5:30 p.m. to 9 p.m. Sunday through Thursday and 5:30pm to 10pm Friday through Saturday through January 1st. The wet weather has put a damper on what is probably the biggest fundraiser of the year for this worthy charity so, if you can, I do hope you go.